The Vi is pleased to share with you an upcoming event that the Vi has been part of, and to extend an invitation from one of our members for a summer school in Russia, and invite you to submit your research for publication in Trans National Corporations journal of UNCTAD. Vi has been working closely with Boston University’s Global Development Policy Center on a project to discuss challenges of multilateralism and come up with an alternative set of principles for a new deal; “Geneva Principles for a Global Green New Deal”. The multilateral system that was built in response to depression and war is in crisis.The 21st century has been marked by financial instability, rising inequality, and a climate breakdown that has given rise to populist forces that are pushing the system to its utmost limit. In this forum, thought leaders of international economics and development will discuss the current crisis of multilateralism and offer alternatives for a better future. Please join us for a panel discussion, which is hosted by Boston University's Global Development Policy Center and the United Nations Conference on Trade and Development on April 12, 2019 from 8:30-10am (Eastern Standard Time Zone). From the Virtual Institute: Happy (belated) International Women’s Day! Here’s to a future where there will be no need to remind the public and policymakers to guarantee women’s rights but only a need to celebrate past victories toward gender equality. The impetus for “microcredit”—the extension of very small business loans to impoverished borrowers who often lack collateral, steady employment, or a credit history—was mainstream finance’s unwillingness to deal with the poor, which, in turn, was widely believed to perpetuate the cycle of poverty. When Bangladesh was hit by famine in 1974, Mohammad Yunus, an economics professor, popularized the concept with the launch of his now-famous Grameen Bank. For his efforts, Yunus was awarded the Nobel Peace Prize in 2006. But just how successful has microcredit been in breaking the poverty trap in developing countries? The Virtual Institute online course on Economic Analysis of Non-Tariff Measures(NTMs), funded by the Government of Finland, was held September 3 - October 21. Ninety-seven academics, researchers and government officials from 44 countries successfully completed the course. “The depth of the course in terms of fully explaining and illustrating concepts went beyond my expectations,” said Faith Melico Zimunya, of Botswana’s Ministry of Agricultural Development and Food Security. Nothing is stronger, observed Victor Hugo, than an idea whose time has come. 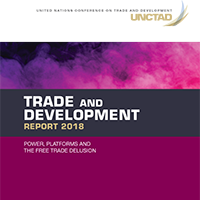 This may help explain why UNCTAD’s latest flagship study, “Trade and Development Report 2018: Power, Platforms and the Free Trade Delusion” has received lots of media attention. Grounded in pro-development analysis—intellectually and empirically—UNCTAD’s annual Trade and Development Reports (TDRs) have long been ahead of the curve in raising red flags for policymakers, as well as in proposing alternative ways forward for catch-up growth and inclusive development. This year’s report, launched on September 26, has proven especially prescient, given rising economic turmoil and the looming threat of another global downturn. The Vi fellowship programme is very beneficial both at the individual and the collective level and it is imperative to continue it.